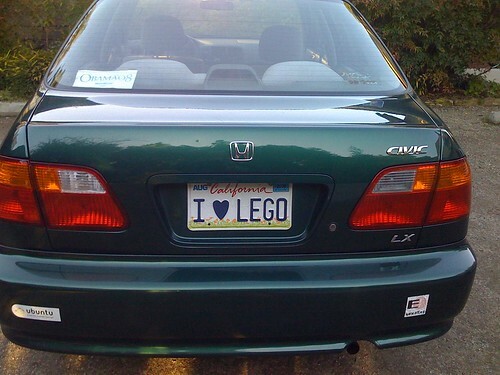 A few years ago I got a special custom California license plate that says “I ♥ LEGO.” And though I’ve had it for several years, I never got around to posting a picture of it online. Well, apparently Flickr user r0wb0t has beat me to the punch. My car was in the parking lot at the Museum of American Heritage as I was helping staff the BayLUG exhibit, and he took a picture of it and put it on Flickr. I discovered this via the Lego Diem blog. UPDATE 1/10: another picture of my car has turned up on Flickr. Whew! Must have been creepy spotting a photo of your license plate online! Very nice indeed, and so are the stickers! There is still hope.